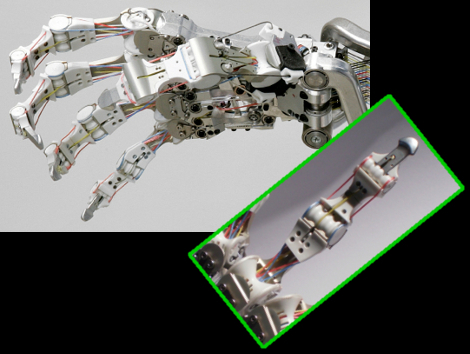 Get your Terminator clichés ready, this robot hand reeks of Skynet. It is designed to function like the human hand, but the main goal is one of robustness. A lot of effort went into making sure this won’t break in the field. Instead of rigid gears, a system of tendons actuates each digit. The pulleys that control these are located in the forearm and each has a spring mechanism that helps to cushion shocks to the apparatus which might damage other grippers. It has bone-crushing power behind the 19 degrees of movement and, as you’ve already guessed, this comes at a pretty steep price tag; topping out around 100,000 Euros. It’s more complicated, and more expensive that jamming grippers, but it’s also far scarier. See for yourself in the silent movie after the break. but hell nice hand, i want two. Pfft, I built a hand way more complex than that when I was a fetus. it seems the budget, rather than the tech was the obstacle in having to wait so long for this development. It’s beautiful. Also, I know that computers and robots could be much more advanced these days if price was not a limiting factor in R&D. I don’t see any reason the cost of the mechanics couldn’t be reduced to the $500-$1000 range. Particularly if it was redesigned to be made from injection molded parts and stamped sheet metal. The question is: how much of the sticker price is overkill materials like titanium, how much is small economy of scale fabrication cost, and how much are the control electronics? The control electronics have some precision sensors per actuator, and there’s a lot of actuators. The motors themselves could be reduced in cost I’m sure. I’m tempted to build one made out of fishing line and corona servos and see how cheap I can go. I thinking of getting metal hands. It is a risky operation, but it will be worth it. who needs metal hands if you have mind control! It’s the hand made by the DLR (German Aerospace Center). I have seen it with my own eyes…it’s amazing! Do we really need robots with 4 fingers and a thumb? wouldn’t 2 fingers and a thumb be enough? who really uses there ring and pinky fingers anyways. Its not like these robotos are playing the piano or musical instrument. There should be a law where you cant make human looking robots! How will we tell them apart on Judgment Day!!! A challenge, make a robot hand using discarded printer parts. Bonus if it uses the printer’s existing metalwork too. Is there a reason hand developers don’t use the same engineering of our hands? For example hold your hand up in front of your palm forward and straighten your fingers, now keep your fingers straight and pull the middle finger down to your palm. The rest of the fingers move, I think this is due to how the muscles are attached to the fingers. @ Scupham : will I will agree with you that that would probably work in most applications I don’t think that we have the ability to create mechanical “muscles” and “tendons” that can be retrained for finer control as human hands can over time. It all depends on what you need your robot to do. @ caleb & pRoFIT: There’s more to a human being than biological machinery. Unless Robots some how inherit both souls and spirits I think there wouldn’t be be an issue. However if God decided to play a joke on us and actually grant these things to machines, it would interesting to see how a smartphone and a netbook would carry out a debate on the meaning of life, the universe or the merits or demerits of the open source movement. Could you imagine what that would do to a robots psyche to hear two individuales carry on as to wither the next generation of Droids should be windows or linux based? Or the thought that their mind could be wiped and replaced at any given time? I’m glad the tech to treat brains like hard drives hasn’t been realized yet. I wouldn’t trust anyone with that kinda power. Now I want to see it pop and lock, and do the robot. @ Kshade sorry, I just get a little carried away some times. Build them like Walter the Wobot and they can make do with three, sorry, thwee fingers.